Seth works on the Linguistic DNA Project in the School of English and the HRI. His work on the project uses corpus methods to investigate semantic and conceptual change in Early Modern English using the very large datasets of Early English Books Online and Eighteenth Century Collections Online. Seth’s primary research interests lie in corpus linguistics, lexical semantics, and variation and change in English, including the history of the English language and World Englishes. His doctoral dissertation at University College London (UCL) investigated the International Corpus of English to describe semasiological and onomasiological variation in English verbs, looking in particular at what we can know about semantics and variation by looking at corpora. 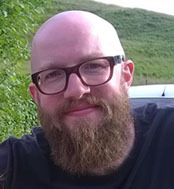 Previously, Seth worked as a researcher at the Survey of English Usage, on the AHRC-funded Teaching English Grammar in Schools project, and on the development of corpus-based English pedagogical apps. Seth is a member of the Keywords Project, and has served on the Philological Society council as Honorary Secretary for Student Associates. Seth is an associate fellow of the Higher Teaching Academy. He has taught: history of the English language at the University of Sheffield and the University of Winchester; undergraduate and postgraduate English grammar, corpus linguistics, and research methods at UCL; English grammar for teachers at the UCL Institute of Education; and an array of widening participation courses for secondary school students from backgrounds under-represented in higher education. He also taught English as an additional language in the USA, Cyprus, and the PRC.